“Sub-biological” systems for some authors, living organisms for others, viruses are definitely not cells but only genetic messages; an isolated virus is incapable of metabolism or multiplication; it can only replicate at the expense of an infected live cell: a virus is an absolute parasite (Lwoff, 1953). A virus usually measures between 10 and 300 nm. 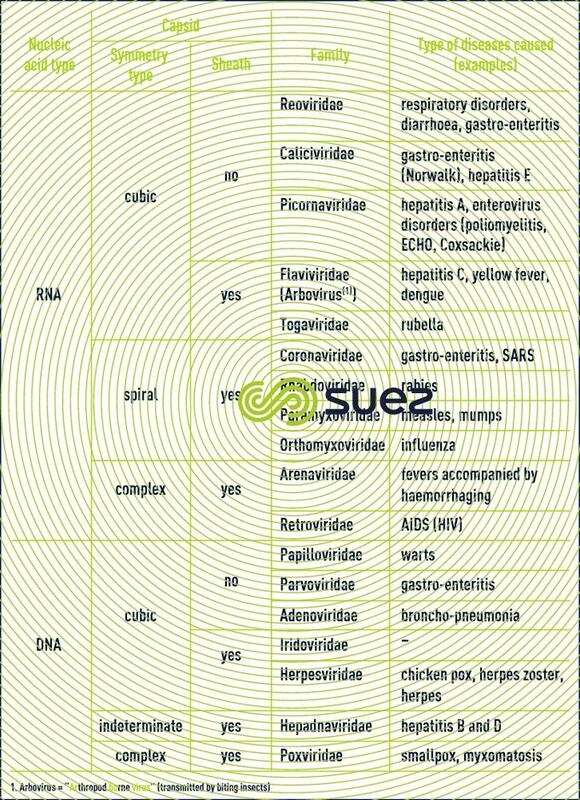 Viruses are classified according to their nucleic acid ( RNA or DNA ) and their morphology (symmetry type, see further on pathogenic micro-organisms figure 11; presence or lack of a lipoprotein sheath enclosing the capsid), as detailed in table 1. Viruses can also be classified on the basis of their parasitic specificity: bacterial viruses (or bacteriophagic, with DNA), plant (with RNA ) and animal (with RNA or DNA ).